It was a game of halves, and the first half did not go well for the Boston Celtics. Buried by another team's swarming defense the Celts found themselves in an unfamiliar position as one of the league's best defensive teams, ending up on the receiving end of what got them to possess one of the best records in the NBA early in the 2017-18 season. Kyrie Irving, shot creator (™) scored only three points in the first half. Al Horford didn't do any better. By the end of the half, Boston was down 18 points and many people assumed it was over. If you did, don't feel bad - it's pretty rare for teams to come back from such a deficit, especially when it's early in the season and the effort it takes to dig out of a whole might seem a little less pressing. 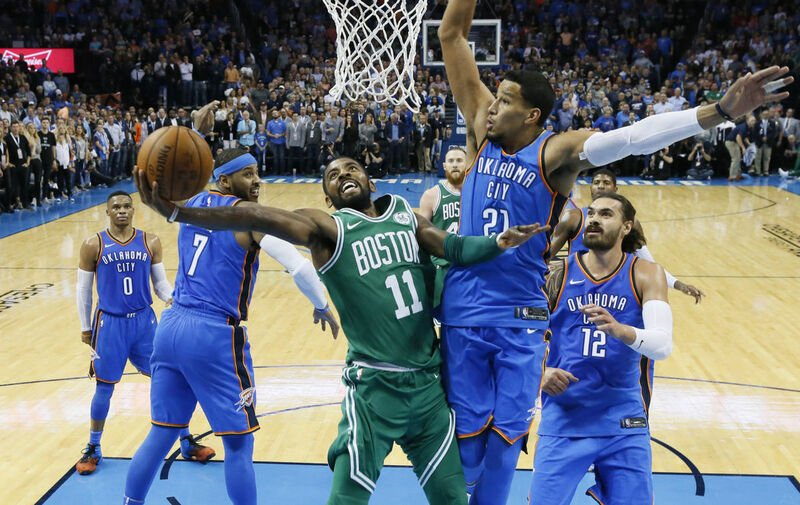 Al awoke first, attacking the basket early in the third, and with support from the Jay Team and the bench, soon got Kyrie rolling too, chipping away at the massive hole they'd fallen into. Then came the fourth. Last season, we were blessed to have a king for that quarter, but tonight it was executed by committee, namely Al and Kyrie. Horford heated up, going for 13 in just that quarter alone, including three-for-three from deep. Kyrie went off, showing us just what Uncle Drew can whip up when he's really feeling it. He dropped 13 as well, with four assists for good measure, including the rarest of NBA plays, the five-point play - if you don't know what I'm talking about, make sure to check the video above. This team is equipped to handle adversity, variety, depth, and opponent evolution - there's little going on in today's NBA this team can't at least hang with if not overcome. The biggest issue they are dealing with seems to be youthful mistakes, and Jaylen and Jayson, thrust into the limelight before they were expected to be there by Gordon Hayward's ill fortune, aren't even the usual source of that problem. Both have been league-leading defenders early in the season, and with rare exception are good for efficient offense as well. Most mistakes are coming from the younger guys coming off the bench, which is kind of what you expect from any bench, never mind on a team with an average age of under 25. Kyrie Irving scores 22 of his 25 points in the 2nd half. He also had 13 points and four assists in the fourth quarter. Hell of a turnaround. The come-from-behind, gutsy win this team pulled off perched the squad atop the league's standings - not just in the weak East, but atop the post-apocalyptic West as well, better than the Cleveland Cavaliers, better than the Houston Rockets, better than the San Antonio Spurs, and two whole games better than the juggernaut-of-juggernauts Golden State Warriors. It's early yet, but it's safe to say that despite Hayward's injury, this team belongs in the contention conversation, defying all expectations to the contrary. We may well see the lofty heights this team has ascended to crumble a bit as the team returns to earth, but based on what I've seen so far...I wouldn't bet on it.